Rhinoplasty is one of our specialty procedures that is skyrocketing in popularity because of the uniquely artistic results that are not possible with less innovative techniques. The nose is a very unique anatomic structure that is like nothing else on the body in terms of it’s complexity, delicacy, and three dimensionality. Rhinoplasty surgeons need delicate hands with an elite level of dexterity and attention to detail, and the surgery itself is more akin to creating a fine sculpture than any other cosmetic procedure. Since Dr. Vendemia is an artist and a surgeon, rhinoplasty surgery is one of his favorite operations because of the artistic quality of the procedure, and the fine detail work necessary to achieve a top notch result. We encourage you to View our Rhinoplasty Photo Gallery to see the incredible results that real patients have achieved in our practice with our exclusive and innovative approach to this procedure. What is The QuickComfort Rhinoplasty™? The QuickComfort Rhinoplasty™ is a more modern version of traditional rhinoplasty surgery that utilizes more gentle surgical techniques, less traumatic instruments, and eliminates unnecessary steps from the procedure, all of which maximizes your comfort and minimizes the recovery period. Less pain and discomfort. As described above, rhinoplasty surgery required a light touch and fine anatomic adjustments. If the operation is done with a heavy handed approach that is common with surgeons who don’t do a significant amount of rhinoplasty surgery, the anatomy of the nose and face will be more swollen, bruised, and inflamed, and will simply take longer to heal. Dr. Vendemia prides himself on not only a light touch, but also a beyond-meticulous attention to detail, and he places a tremendous amount of importance on minimizing discomfort and recovery time in all of his surgeries, but especially in his two top cosmetic procedures: The QuickComfort Rhinoplasty™ and The Rapid Recovery Breast Augmentation™. Less bruising and swelling. Most of our QuickComfort Rhinoplasty patients wear a neatly-applied and size-minimized splint for a period of 4-7 days, and have very little bruising, swelling, or pain. Although the “raccoon eye” appearance is common in rhinoplasty surgery overall, it is not common with the QuickComfort techniques, and the majority of our patients are able to go back to work within one calendar week of their procedure with either nose bruising at all, or a minimal amount that can easily be covered up with a touch of concealer. Of every case is different, and this kind of recovery is not guaranteed for every patient, but this is the real-life experience for the majority of rhinoplasty clients. No nasal packing. Many rhinoplasty surgeons feel that it is necessary to pack the nose after even routine rhinoplasty cases, but we feel that in most instances this is unnecessary. Nasal packing was a common method for controlling bleeding after rhinoplasty operations that include a great deal of work on the septum or other internal structures like the turbinates, but it has almost no role in modern day cosmetic rhinoplasty surgery, and only contributes to an enormous amount of discomfort after the procedure. Nasal packing is notoriously uncomfortable and problematic, so you can be rest assured that no nasal packing will be used unless it is absolutely necessary. Back to work sooner. All of the above advantages of The QuickComfort Rhinoplasty™ lead to one final conclusion… you are able to get back to work and normal activities sooner. In most cases, you will look perfectly normal on the 4th day after the cast comes off with just a touch of concealer at the corner of each under eye (and sometimes even that is not necessary). Most patients are easily able to return to work one week after surgery, and exercise and other non-stenuous physical activity is usually possible between 10 and 14 days after the procedure. Are you considering rhinoplasty in New York City? We offer the most innovative techniques and the quickest recovery times in the safest environment possible. Please feel free to contact us online or call our office at 917-703-7069. What are the steps of a typical rhinoplasty? Reshaping the bridge and removing the dorsal hump. A dorsal hump and/or a wide nasal bridge are some of the most common features that both men and women wish to fix, so the first step of the procedure is removing the hump (a portion of which is cartilage and another portion is usually bone), and then preparing the cartilage portion of the bridge for the final step in the procedure where it is matched to the rest of the new nose by precise fracturing of the nasal bones to narrow the entire bridge to create a new perfect harmony between all of these structures. Trimming and reshaping the lower lateral cartilages. 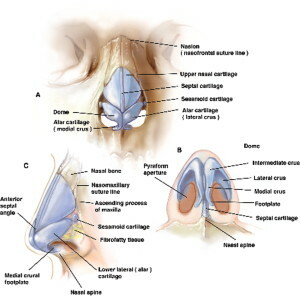 The lower lateral cartilages of the nose are two horseshoe-shaped cartilages that determine the shape of the nasal tip. In many rhinoplasty patients, these cartilages are too large, too bulky, too separated, or asymmetric enough to make the nose appear crooked. In nearly every rhinoplasty operation, these cartilages must be trimmed to an appropriate size, repositioned and reshaped to create a more defined, less boxy, tip that will be more attractive and less bulbous. Smoothing the bones and upper lateral cartilages. The nasal bones and upper lateral cartilages determined the shape of the bridge of the nose running all the way from the tip to the area between the eyes (the radix). This entire area must be smoothed down with a series of gentle polishing instruments to ensure a final result that is free of any noticeable contour irregularities. Matching the nasal bones to the new bridge and tip. The last step of nearly every rhinoplasty operation is a very precise fracturing of the nasal bones which allows the bones and the upper lateral cartilages to narrow just enough to match the new, more defined, tip. This step should never be overdone so that the nose remains very natural looking, and although this step creates a lot of anxiety for men and women interested in having a rhinoplasty, it is not a harsh, forceful process as some might imagine. It is a very gentle and precise technique that does cause any additional pain or discomfort (or at least is should be as long as your surgeon has a light touch and experience with rhinoplasty surgery). The “breaking the bones” step should not be feared at all as long as you trust in your surgeon’s ability and experience. An open rhinoplasty requires a 1-2mm incision in the columella underneath the nose, while a closed rhinoplasty avoids this incision and keeps everything on the inside. Each approach has it’s advantages and disadvantages, and neither one can be used successful in every patient. Some rhinoplasties will turn out much better with an open approach, and some may do better with a closed approach. In any case, neither the recovery nor the scarring is significantly different between an open or closed procedure, so anyone who claims that there is a dramatic difference between the two is either inexperienced or misinformed. The columellar scar from the open approach is nearly always inconsequential after a few weeks, and can be almost impossible to see after 6 months, so there is never a reason to force a closed approach only to avoid a scar that is inconsequential in most patients anyway. Forcing a closed approach for a nose that would benefit from the greater precision and visibility possible with an open technique will only lead to an inferior result. Your surgeon should always advise you which open is the best for you, so don’t be afraid to ask. How long do I have to wear a cast after rhinoplasty? Most patients will wear a very neat and relatively inconspicuous cast for 4-5 days, and a small percentage will wear it a few days longer, but only when necessary. When can I go back to work after rhinoplasty? Most patients can return to work 7-10 days after the procedure, and can easily work from home the first day after the procedure. How long until I see the final result of my rhinoplasty? Primary (first-time) rhinoplasties will look better than what you started with as soon as the cast comes off on Day 4 or 5 after the procedure, and then continue to improve for the next 12-14 months. The majority of the healing process occurs in the first 2-3 months though, so you can consider the result at that point to be a “near-final result”. For secondary (second-time) or higher level revision rhinoplasties, the final result will take two years or longer, although again the majority of it will occur within the first 6-9 months. Can I have a rhinoplasty at the same time as another cosmetic procedure? Yes, multiple procedures are not only possible with rhinoplasty, but they are also fairly common. Our two most common combinations are + rhinoplasty + liposculpture, and rhinoplasty + breast augmentation. More involved procedures may or may not be recommended depending on the complexity and total length of the surgery time, so if you are interested in having something else done with your rhinoplasty surgery, make sure to discuss it with him beforehand. The cost of rhinoplasty surgery is highly variable and depends on what is involved in your particular procedure. If the only issue you wish to fix is a dorsal hump, the average price may be as low as $6500. If your nose needs the bridge, the hump, and the tip adjusted, the price may be $10,000-$12,000. For even more complex additions to the procedure like septoplasty procedures, nasal fractures, or breathing corrections, the price may be higher. The only way to get an accurate figure is to first be examined by the doctor. Only he can determine what will be necessary to give you the result you’re looking for, so scheduling a consultation is the first step. 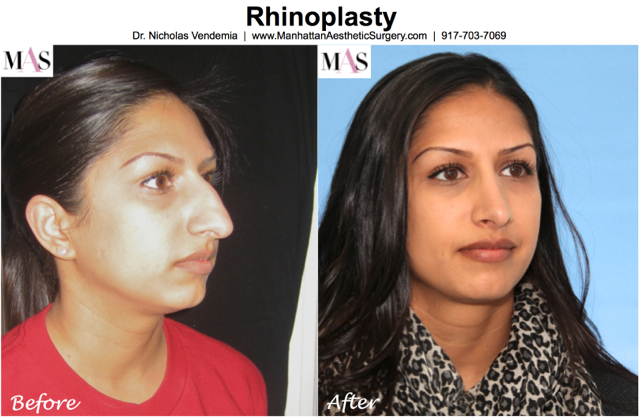 Dr. Nicholas Vendemia performs rhinoplasty for women and men in the New York metro area. He is a leading cosmetic surgeon in New York City with a reputation for custom care and beautiful results. For more information about The QuickComfort Rhinoplasty™, regular rhinoplasty, or other types of nose plastic surgery like nasal fracture repair, tip rhinoplasty, or septoplasty, pleasecontact us online to schedule a consultation or call our office at 917-703-7069. If you haven’t already done so, check out the amazing results in our Before & After photo gallery by clicking on the image below. We’re looking forward to meeting you!